Back in May, I did a 100% suspension rebuild in prep for a trip to Alaska. 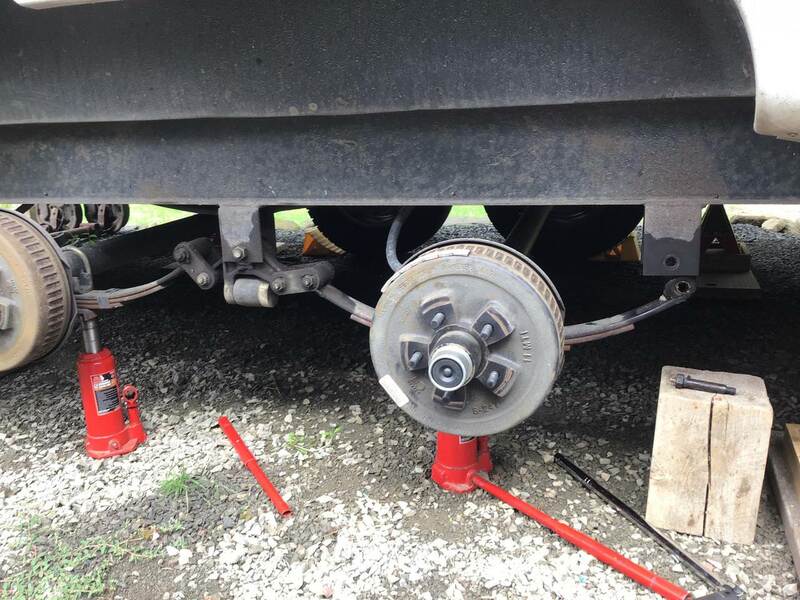 New: springs, axles, brakes, drums… everything. The rationale was several fold. First, I had drop axles flipped and I prefer straight and not flipped (for ground clearance, aesthetics, better access to brakes, etc…). I wanted to do brakes, since I have had several instances of grease blow by of the seals and the brakes were pretty oiled and I wanted to go to Nev-R-Adjust. On tearing it apart I found that the bronze bushings in the Dexter heavy duty wet bolt kit had failed (as in mostly gone), so the spring eyes and wet bolts were shot from bolts riding naked in the spring eyes. The EZ-Flex equalizer was shot. I had done that upgrade 35000 miles before. Dexter graciously sent a new heavy duty suspension kit and equalizer and I bought new springs to go with the other new parts, along with nice new tires and away we went. This is what the install looked like when done. After 12,000 apparently hard miles. In setting the axles, I designed this fixture to set the axle spacing. This was modeled after the setups used to align semi trailer axles. After careful measuring, I was convinced that the fixture held the tape in the correct position to get perfect measurements. The bushing that the swivel and tape measure is connected to moves freely on for the left and right side measurement. We used a scale to tension the tape (not shown) to insure a consistent measurement. This idea was again stolen from the semi trailer industry and allowed up to measure very repeatedly. Our axle placements went very well and I feel like the fronts were placed within 1/64” side-to-side and the rears placed with 1/32” of the front (mainly because we got bored of perfection and that was way inside spec). This system works really well and anyone who does this sort of measuring knows that tape tension can impact a measure like this a lot. We got so that we could measure accurately to a 1/64 by varying the distance and tension. We would increase or decrease tension so that the measurement would fall right at a mark on the tape to eliminate any interpolation between hash marks. So, 12 feet one inch and a quarter at, for example, 8 pounds is longer than the same measurement at 12 pounds. One big fail last time was the EZ-Flex. Because the hanger does not hold the two halves together the halves of the equalizer spread out resulting in the inner bearing failing. I found shim washers that would sit between the hanger and the equalizer to support the equalizer from spreading, yet allow free movement of the equalizer (0.048 + 0.075 = 0.0123 to fill a 0.0125 gap). On install it was stiff, but easily movable by hand when first installed, moves freely now. I believe this was a success, the equalizer did not splay. I have not pulled that part apart yet, but it feels good. The bushing where the shackle bolt rides has worn and there is a lot of slop now. So one issue solved, but it doesn’t really matter if the bushings are wearing out. So now to the question, after 12,000 miles with greasing at every 3,000 miles. This is what the bolts and bushings look like. My plan was to inspect and replace all bushings, but now I see that some bolts are worn and the bushing in the equalizer is pretty worn. Front bushing pretty worn, but holding. Cracked, chip missing and deformed. Front bolt looks pretty good, nice polish and only a little worn, I’d put it back in with a new bushing. Rear bushing very worn and deformed with cracks. Rear bushing removed, end is chipped out from removal, but deformation is from the gap in the spring eye. Rear bolt is worn with two flats that match the deformation in the bushing. I don’t know if you can get the shape from the photo, but the center line you see on the bolt is the original black oxide and on each side of center is worn a flat. The bolt should be round in cross section, but now is shaped as the bushing (flip bushing photo upside down in mind). I would not put that bolt back in with a new bushing. What to do? My guess is that I could get another 5,000 miles on what I had. I do not want to wear through the bronze bushings and wreck my spring eyes and have to tear the whole thing apart and space axles again. I talked to Dexter and they are sending new parts. They will look at the parts I remove. I talked to Morryde several times about their wet bolt kits and they said that their kit probably would not fare any better (I pushed on where the basis for that comparison came from, but couldn’t get that info). In contrast, one other person at Morryde said that they had never heard of a failed bushing. I asked if they knew about the quality and type of the bushings compared to Dexter and couldn’t get that info. Thoughts? The easiest thing is to buy a whole new kit for $250 every 15K and just put it in. No one else seems to have this problem with bronze bushings in my research. I like your tow ball fixture and the swivel. Much better than the way I did it with the level and the score line on the nut. Both work, but I like your idea better. Your cracked bushing is similar to mine. I see a few reasons on why the bushing cracks from my experiences. The actual bushing material. I do not know the actual bronze makeup of the Dexter bushing. 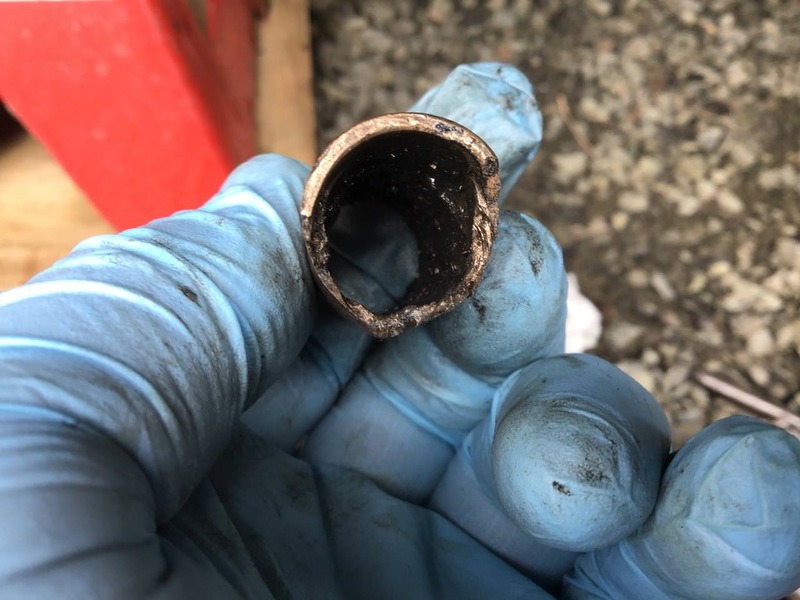 If it is a sintered material, like in an Oilight bushing then the tiny holes in the bronze can create stress failure points if the bushing is not 100% supported in the housing. I have a 10X loop in the barn and I found some spare new Dexter bushings this week in a sort and clean effort and will have a look if I can see the sintering holes. This is a 2 fold issue. The bushing and the spring. The spring eye is not a 100% true machined hole thus the bushing is not 100% supported on the OD all the way around. The area where the end of the spring leaf wraps around can have good gap where it closes the circle. That gap has no support for the bushing. The spring also has a round radius on the ends of the hole which varies in the manufacturing forging process leaving no support to the bushing. Even if the bronze is not sintered, lack of back up (any loss of backup) support will in time allow a crack to start. These springs are so mass produced at a low cost standpoint I do not think we can get away from the lack of 100% support to the bronze bushing. For a busing to work correctly it must be 100% supported on the back side. We are also sort of at the mercy of the diameter of the spring pin. 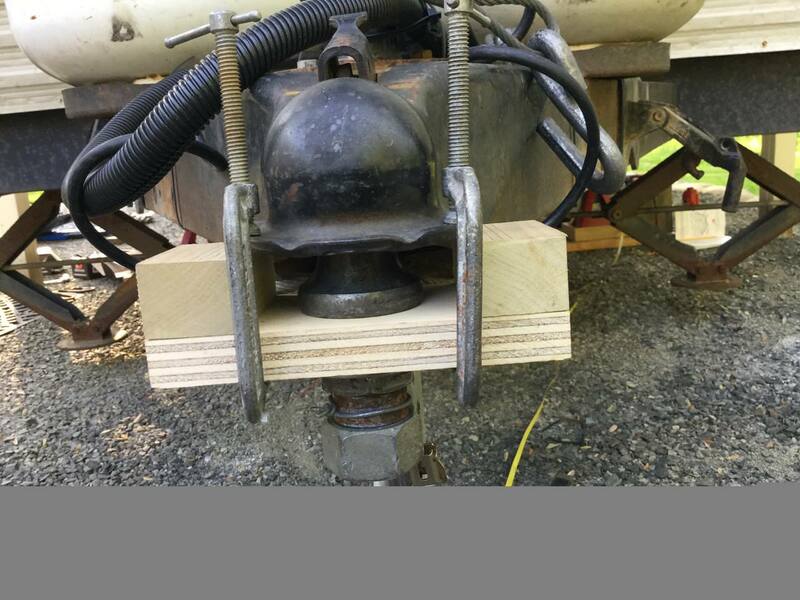 If the bushing had a much larger bore and the pin larger in size, the stress on the bushing would be less and that extra benefit may help reduce some of the cracking due to lack of 100% back support. The uneven pin burnishing may be from lack of lube grooving or at least contribute to it. Again a larger diameter pin/bushing and a good grease groove can totally eliminate that issue. Why most people do not have issues may be, I do not think there are that many trailer owners out there that look as close as we are. Or if they do, do they talk about it in the detail we would like to see? 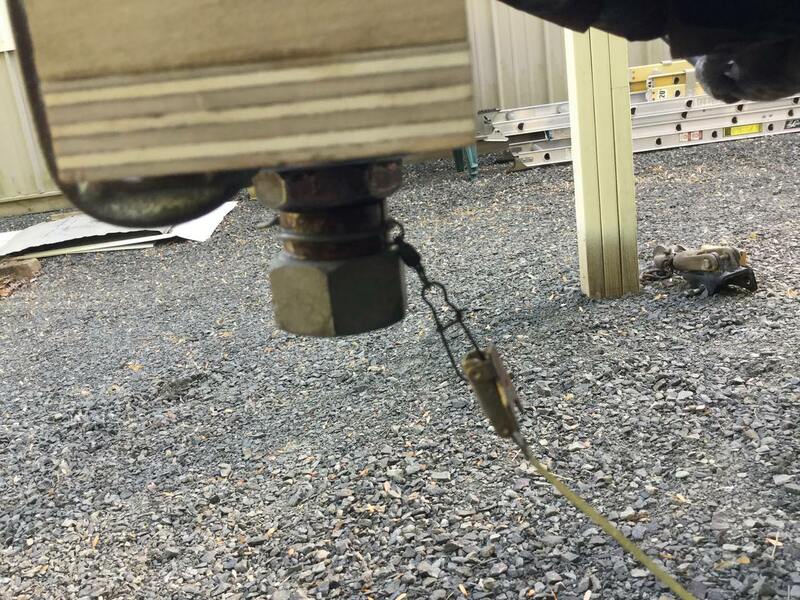 Many trailers are still riding on steel on steel with the nylon bushing shot. And those on bronze and if they grease them, they work so much better than the nylon they may feel they have a winner as they may not have looked as close are we are. And to them, that is good enough. If all things go as planned..., this winter/next spring I will convert my bronze to the Never Fail bushing. I do not know what type of material they make them out of but they stand up to a lifetime warranty and tests of over 100,000 miles. There is no other bushing I know if even with a warranty like that. I know there are plastic materials that can last, I'm hoping they are using that material. The plastic bushing I feel can be more tolerant spring hole issues. 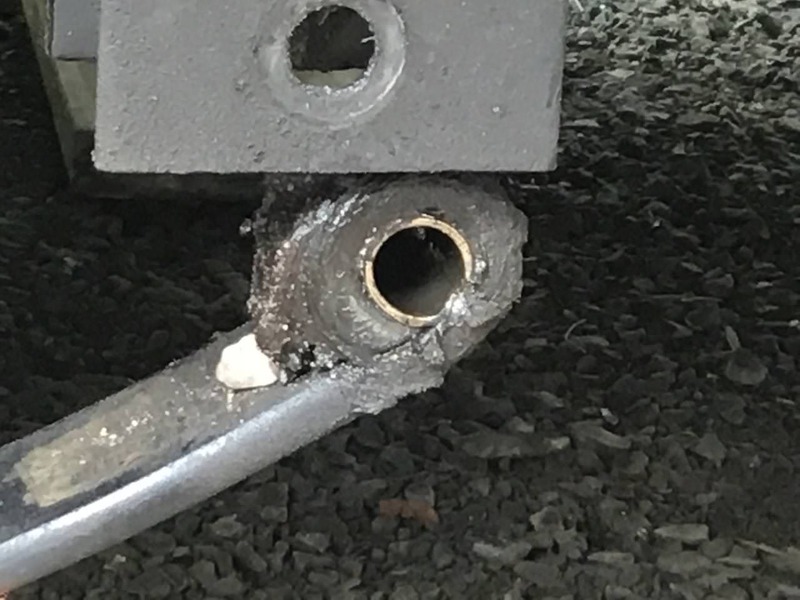 The spring gaps or lack of support will not create stress risers in the bushing as the plastic will flow and not start a crack like the rigid bronze. I installed one Never Fail bushing this year to replace my worst cracked one. Then headed out on our camping trips. Not a lot of miles compared to yours but a place to start. I will report the findings when I have it apart. Hope this helps and thanks for a great report back!!! I saw that you went to Never Fail, but I didn't catch that you put it on just the one. That will be interesting to see the result. I'm hoping it works out for you, but my gut is against them holding up. I hope I'm wrong, but there is a little voice in my head that says the lifetime warranty is only there because most people won't use it and they are cheap to lifetime replace. Thinking about the spring eye imperfection, I agree that it is a huge piece of the puzzle. Were the eyes perfect and the bushing supported, there wouldn't' be a problem. It is a shame that the imperfection of the spring eye lines up with the pressure point. I have been running alternatives though my head. 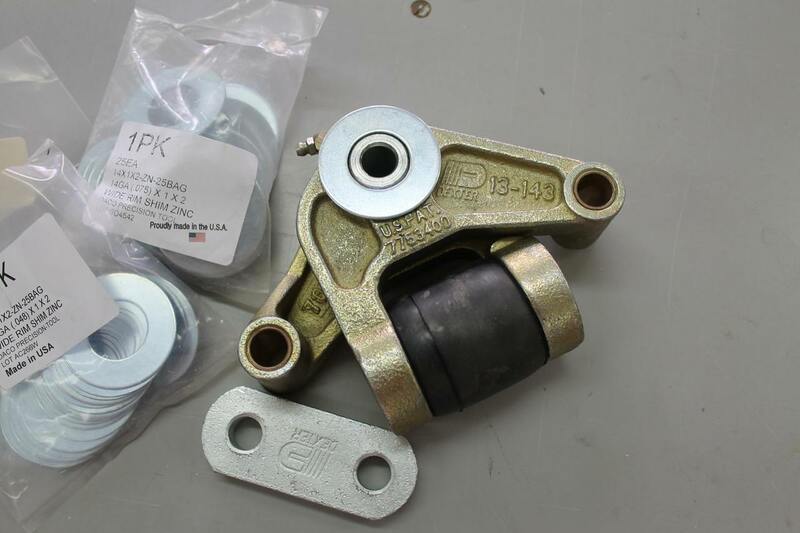 For example, steel bushings, they are out there for trailers. A lot of automotive spring bushings appear to be steel core with rubber for cushioning on a steel bolt (I'm no expert on this, but they sure looks like it). I wonder if they went with bronze not for their superior wear characteristics, but because they can be press fit into the standard spring eyes where steel would be problematic given the tolerances to drive in (this is not as much a problem in automotive because the steel has rubber to allow the press fit). Proof of concept is that Dexter makes a steel core rubber bushings for larger springs (I'm not saying to use that bushing, but as an example of it steel works for that, why not for me). This may be the easiest way to go. I also wonder about reaming out the eyes slightly to make them perfect and then using a custom bushing. A couple reamers stepping up in size and just open until the imperfection is gone. I don't know if that could be done in place, but that would be my preference. I have a big drill press, but I'd rather not remove everything. I've never don't something like that, I bet there is a lot fo torque there reaming an eye out. Another thought is some sort of bedding compound in the eye to support the bushing. A Dexter warranty guy mentioned that, then mumbled and backtracked on it. If you could find something that would work, but be able to be removed (maybe heat sensitive to remove). A strong, dense RTV would work, but the bushing would never come out. My dad was a tool and die maker and he is going to visit this weekend. I can get some feedback from him on feasibility. Do you have any experience doing something like that where you could offer feedback on how hard it would be? The tooling expense wouldn't be trivial. A new kit from Dexter is on its way and I confirmed that it should be in early next week, so that is going in because I want to go grouse hunting in Maine in a couple weeks. I'm installing Morryde's Xfactor crossmembers as well to give the hangers/frame some more side-to-side stiffness in case that is a factor. Dont think spring steel is the easiest thing to drill but maybe not too bad to ream out some. 30 to 40 years ago, yes I am dating myself... I had tested a lot of plastic bushings. They have their place but many of them would fail fast if the contact pressure loads where very high on a small bushing. They would basically squirt and wear thin. But in the last 10 some years, mega advances have come. New materials have come out and before I retired we were testing one inside a food sterilizer machine. This is a hot, wet (steam heated water) environment and trying to hold lube inside was useless. We had to go with outboard bearings and then mechanical seals to hold the water back. We tried a lot of bushings inside years ago and they all failed. But with new advancements in polymers and finding the right makeup, darn they made it work. We are talking 1,000's of pounds of pressure on the bushing. The surface finish on the shaft had to be polished almost to a mirror finish. But the bushing held up as long as we could pump water lube through it. Point is, if Lippert is using a material like that, and by feeling them and looking at them, they are not the Delrins, UHMW's, Peak or other plastics out there. I'm really hoping they will work. But.... time will only tell. To the spring, you used the word ream. Meaning a tool steel fluted reamer. My first thought is, it will dull your reamer really quick. You are trying to remove material that can easily be seen with the human eye. If you were trying to ream out 0.0005" or 0.0015" then reamers work. Even up to 0.010" on softer materials but some of the leaf spring eyes may need a lot more out of them to create 100% contact surface. There are many ways to make leaf springs, some are so hard the only thing you can do is grind or EDM burn it it once it is formed and tempered. Ask your Dad, to do a precision grinding operation on that many holes is doable but it is a lot of work. The hole needs to be dead true if your going after 100% back supported bushings. It would need a precision machine to do this. If carbide would cut the spring, a milling machine with a carbide tipped boring bar may be an option that is more practical then grinding. I just don't know how much material you will need to remove to get full cleanup. And then is the spring a weaker at the location? Going to steel bushings, we are again constrained on the size to fit in the spring eye. If you are going with steel bushings, then the spring bolts will have to be changed. They are only a grade 5 bolt for all practical purposes. If you put a hard steel bushing in, then the pins will start wearing. This one is a tough nut to crack with such cheaply made parts. While we are on wild ideas... Right now you have 7 pivots per side, or 7 bronze bushings including the equalizer. or 14 bushings total. There is a suspension conversion that will change a lot of that. The number of bushings would go from 14 down to 4. I cannot find the links right now, but they change from leaf springs with 2 eyes and shackles with an equalizer to slipper springs and no equalizer. Basically there is a slipper spring front and rear and the slipper part is in the middle. This creates independent wheel suspension. They were selling these kits for large 5th wheels but it was marketed on trailers too. I think Lippert may have bought them out. If this is of interest, I'll hunt some more. This would leave you with only 4 bushings to deal with and no shackles or equalizer. I think they used Never Fail bushings in it too. Maybe I'm crazy, but I'd rather see a tandem trailing arm and air bag setup. 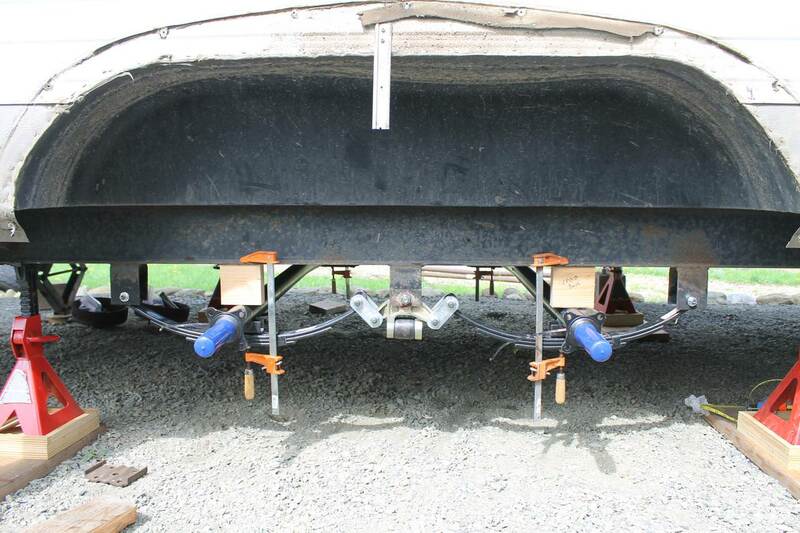 It would also be pretty sweet if travel trailers could have sliding axles that could be adjusted forward or back to get to an ideal tongue weight based on cargo and fluid loading. OK, I'll stop dreaming now. Thanks John, great info as always. I was reading about reaming the spring eyes last night and it looks like the steel is probably too tough in a spring. It appears that in the old days bronze bushings were not uncommon in motor vehicles. 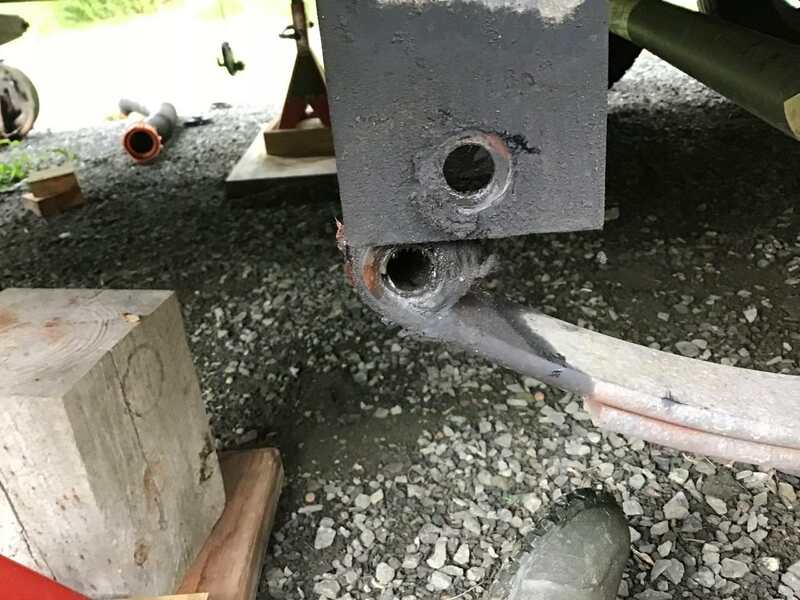 The bushings were oversized with an undersize bore and and were press fit and then the bore was reamed for size and roundness after the deformation of pressing. For them to last properly from my read the bushing needed to be at most one thou over the shaft when reamed. There is a lot more slop in the bushings in the kits than that. I didn’t read extensively on this, but gleaned enough to know that I’m expecting too much. I’m not totally out of the rounding the holes thoughts, but it looks like a dead end. 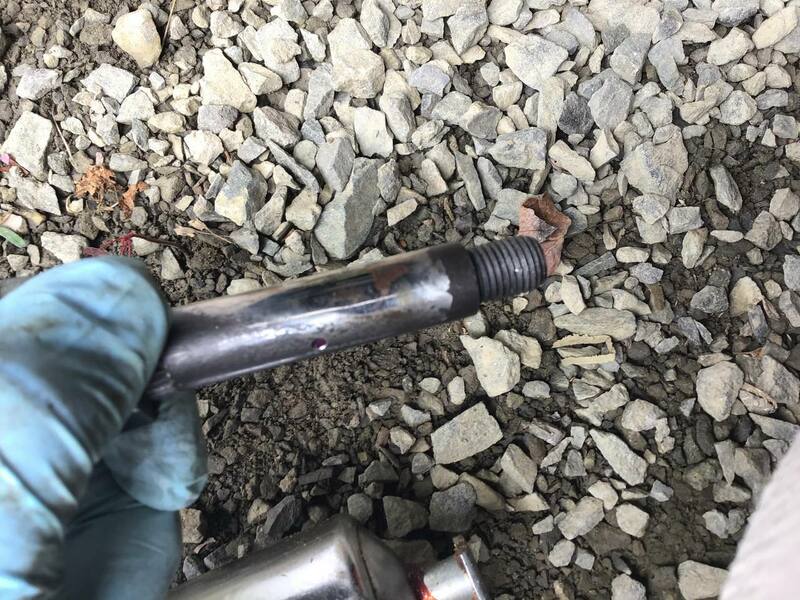 On the steel bushings, I do have some good data that the bolts do hold fairly well steel on steel, since all my bushings last time did not fail instantaneously coming into the drive. I was driving a fair bit steel on steel within a sloppy spring eye, but how long I can’t say. The thing that surprises me is the amount of wear of the bolt within the bronze this time. Better bolts may exist within the industry. Since I’m installing the morryde cross members, I have to use their longer bolts and they will get a test with dexter bronze. Given the amount of work and money on new axles, springs, etc. this year, I’m not going to look at making any more major suspension changes, so no need to investigate anything else. Thanks. This job I’m about to do will get me 2 years if I replace everything with the dexter stuff they are sending (next year I probably won’t do over 4K and then alaska the next year, so under 20 k miles, I throng that will be ok). By then we will have some good data from your test as well. When I tear down and replace, I’m going to try to correlate spring eye shape/slop with bushing wear. The other thing to keep in mind is that the well supported bronze in the equalizer end shows quite a bit if wear/slop now (but nothing like the spring bushings) so it could be my driving habits (dirty rough roads) or quirk of my trailer (why I’m doing the cross members). I just got parts from dexter and will temper the statement about the wear in the equalizer end. I said “quite worn” and comparing to new parts, I would now say “noticeably worn” or minimally worn. There is more play, but not radically more than the new parts, the bushing also is evenly worn. An interesting note the new wet bolts from dexter that came in the shackles, but not the individual ones, appear to be sourced from the same place as morryde. They are plated silver now, the singles from dexter are still black. I have the morryde and dexter in hand and they appear identical. I sent some photos to Dexter Warranty and talked to them a couple times. 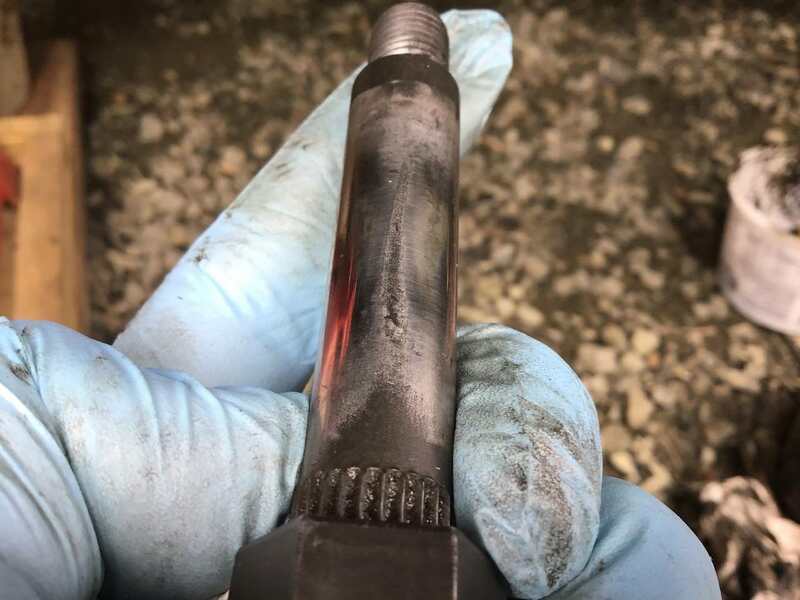 He shared the photos with the engineers and the conclusion was that the bushings looked like they were worn, as in typical wearing out worn and just about to fail worn. 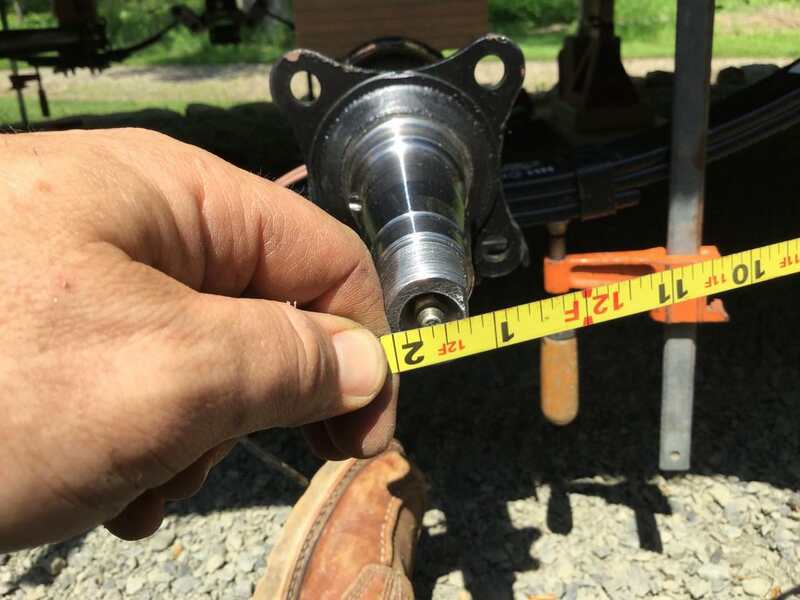 When I pushed on premature wear at 12K miles with a light trailer (1/2 the weight rating of the components), he said that he would send replacement parts and there were not answers about why. I declined more new parts thinking that all the stuff is new now and I'm on my second replacement. In our discussion, it is clear that the spring eye out of roundness and its inability to support the bushing well at the contact point on the bottom is a culprit (in both Dexter's and my mind). He suggested bedding the bushing in epoxy to fully support the bushing. I've been thinking about that and it may be possible. If I had a tool (set of stepped up in size drill bits or reamer of some sort) to remove the bronze, that might not be too horrible. I'm planning on about 5K miles this summer and then AK in 2020. I can't imagine that I wouldn't do something before leaving for AK. At least new bushings. If new bushings are going in, I might bed them in epoxy. I have several sets of springs that I could test the idea (both bedding and then later removing the bushing). Anyway, that is it for now. I'm all new and ready for the summer. I have not yet made it to installing the rest of the LCI Nev-R-fail bushings. I may get to it in the next month or two if the project list lessens some. There is one installed where the bronze cracked on mine. Only a years worth of testing, but I'll report the findings when I get it apart. I agree, the issue with the bronze is the lack of 100% support. They are for sure light years ahead of the standard nylon, but not quite the ultra long term solution due to the spring tolerances. I have a gut feeling the epoxy may not bond right and crack. If you try it, you are going to have to use some kind of really good degreaser to get all the contamination out of any little porosity marks in the steel so it has a good chance of bonding. Thanks for reporting back. The learning never stops. Years ago all king pins were brass then all king pins were plastic as they are today. A king pin only turns on a vertical pivot and the thrust is a bearing or a flat brass ring. 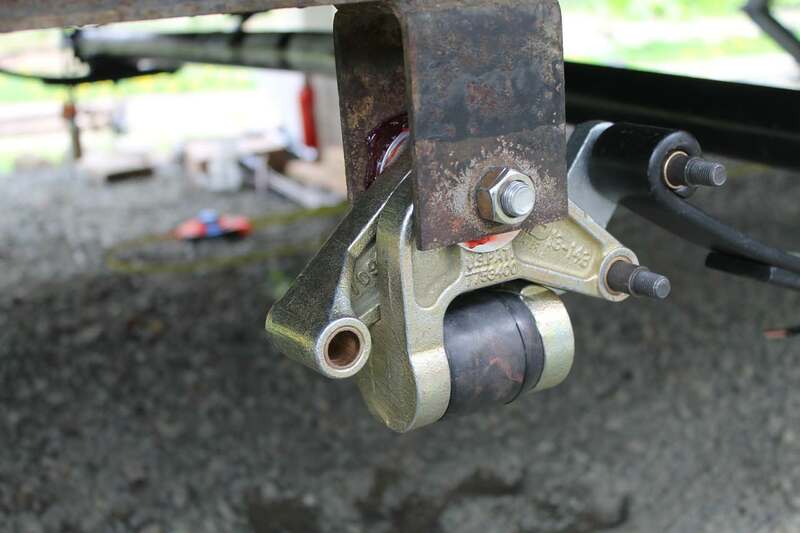 The rocker beam on a camper bears all the weight and doesn't move more that several degrees, to be honest both types seem to last about the same I have done mine twice once with metal the second with plastic I see no difference in longevity. The latest have a black plastic bushing and no fittings. Yeah mine is a little one but I would think they are sized accordingly. The biggest issue is the spring eyes, in the dark ages springs actually had a greasable bolt. The springs are hardened but if the bushing is trashed eventually they will wear it seems strange that they don't use a rubber insert like car springs do. It seems to be a fact of life that the moving parts will need replacements periodically no matter what the are made of. I have been researching more on the "wear" topic. It appears there may be other factors we may have not discussed creating bushing wear. Balanced tires. I have found reports from some camper folks stating they had less bushing wear when they had balanced tires. They never gave a reason, just they noticed a difference. This did not seem to matter if it was the original nylon or bronze bushings as folks where giving up on bronze due to the wear. But some of those bronze bushing failures not have balanced tires. While some folks had nylon go longer with balanced tires. I myself have been using Dyna Beads for tire balancing since I did all my suspension upgrades, which also helps balance the brake drum issues, so I myself do not have any data to compare between balanced and unbalanced tires. 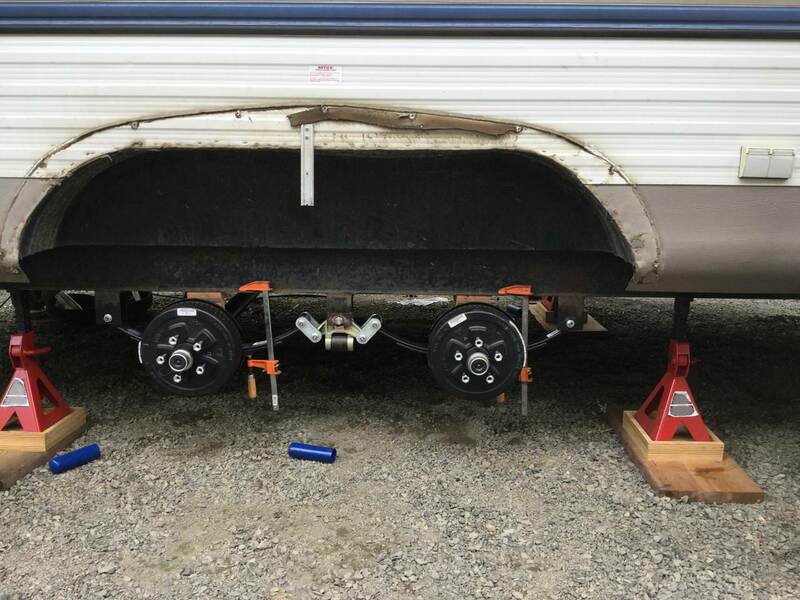 But... after seeing a few videos of a Go Pro camera looking at the suspension working, I think I may have found at least one possible explanation of why balanced tires campers may potentially have less suspension wear. Bottom line: Vibration. Unbalanced tires/brake drums do create higher vibration in the suspension. That excess vibration can be different depending how far out of balance the system is. The leaf springs and equalizer bushings could take a good sized hit in potential excessive vibration between the pin and the bushing. It takes movement to create the friction that causes the wear. The higher the vibration, the more movement. By chance, were the tires you used last year on your bronze bushings balanced? And if balanced I'm assuming they may have used a spin balancer with traditional wheel weights on the rim edge. And did they use a hub on balancing machine to spin the wheel by the wheel stud holes verses the stamped center hole in the wheel? I'll see if I can find that video showing the vibration that goes on in the suspension just traveling down a normal road. It was eye opening to say the least.